Matt Kell is a young husband and father in the late stages of terminal cancer. His former classmate Cathy Spehn has recently moved to his hometown with her husband and three children. Four weeks after Matt dies on Christmas Day, Cathy develops a bad headache. She dies seventeen days later of inoperable brain cancer. On her last day of life, she tells her husband, Michael: 'Call Gina Kell.' 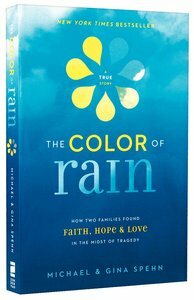 The Color of Rain illuminates the stepping-stones of healing that led to a new life for Michael, Gina, and their five children. This remarkable real-life Brady Bunch story explores the differences between despair and grief, denial and joy, bitterness and redemption. Told from alternating points of view, Michael and Gina's gripping journey of 'growing new hearts' inspires readers to not just survive loss but to receive the courage, faith, and identity that God gives in the midst of tragedy---and be transformed forever. About "The Color of Rain"
Customer Reviews For "The Color of Rain"
What an amazing story. Although written as a biography there is so much that we can learn from the lives of the people in this book. Michael and Gina each walk the journey of losing a spouse to cancer. Due to the gifted way that they both can express their feelings we get an insiders view of grief and how to best support someone during the journey. There is a lot to learn for those of us who find ourselves walking the journey beside someone in a similar situation. I found myself taking notes as though it was a teaching book and not a biography. Apart from all you can learn it is a beautiful story of God's grace and love. It is a story of hope and rainbows.This is a book that will enrich your life.